At a glance | Karnal | Tourism Hubs | Haryana Tourism Corporation Limited. Karnal, also known as the rice bowl of India, is one of the oldest districts of Haryana. The city has gained importance since Mahabharata era. It is believed that it was founded by Raja Karna, the eldest son of Kunti and hence the city is called the city of Daanvir Karna. The place got its share of fame in 1739 when Nadir Shah defeated Muhammad Shah here. The city is known as a walled town. The citadel of old time can still be seen in form of Kot Mohalla (Kot means fort). The fort was built by Raja Gajpat Singh of Jind. The fort was used in many ways as British converted it into a residence for Dost Mohammad Khan, Amir of Kabul, part of it was also used as jail and a school was also running in the fort. Some of the dignitaries have their association with the city of Karnal. Late Dr. Kalpana Chawla, an Indian-American scientist and NASA astronaut was born in a Punjabi Hindu family at Model Town, Karnal. She also did her schooling at Tagore Baal Niketan, Karnal. The first Prime Minister of Pakistan, Liaquat Ali Khan was born in Karnal. Today, Karnal is also famous for manufacture of agricultural implements and its spares. More than 40% of country agricultural implements and spares are manufactured here. Location: Karnal is connected through Delhi-Ambala rail line & Sher Shah Suri Marg (G.T.Road) to all important places in the country. It is 123 kms from Delhi & 130 kms from Chandigarh. 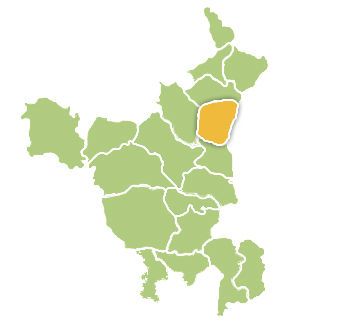 The Karnal district is surrounded by Kurukshetra District on its north-west, Jind & Kaithal district on its West, Panipat district on its south and Uttar Pradesh on east. Postal Code: 132001 | Longitude: 76° 31' 15" and 77° 12'45" East | Latitude: 29° 9'50" and 29° 50' North | Area: 2458 sq. km | Altitude: 748 feet, 227 meters | Population: 1506232 | Literacy Rate: 76.40 | STD Code: 0184 | Villages: 435 | Language: Hindi, English | Best season to visit: All seasons to visit. The nearest airports are Indira Gandhi International, New Delhi and Chandigarh Airport, which are 140 kms and 131 kms. respectively. Karnal Railway Station near Chaman Garden, a diversion from State Highway No. 9, lies on the Delhi-Ambala rail line. Some of the important trains that start and pass through Karnal include Amrtisar Express, Jhelum Express, Kalka Mail, Chandigarh-Delhi-Shatabadi, Jammu Mall and Himalyan Queen. The city is located on NH 1 and offers bus connections to many of its district towns as well as Delhi, Chandigarh, Ludhiana, Patiala, Dehradun, Haridwar, Gwalior, Merrut, Shimla and Dharamshala. Haryana Roadways Volvo passes through Karnal. For Haryana Bus Enquiry : Dial 0180-2646544.